Avoiding your own premature cremation. If you think electricity is always trying to “go to ground”—you may be the victim of urban legend. We cannot truly come to grips with the importance of a home’s electrical grounding system, and the bonding of the home’s metal systems (water pipes, drain pipes, gas pipes etc), until we get this myth corrected in our minds. If I have any readers left at this point, I consider it a great honor. I am well aware that the vast majority of my readers do not give one hoot about any of this as long as everything works when they plug things in or turns on when they flip a switch. All readers, in my opinion should give a hoot however, in order to not get shocked or electrocuted while using those beloved appliances. I think that electrical system grounding and bonding should be taught in schools—it is just that important and only becoming more so every day. Contrary to urban legend, the way the electrical system actually works is that electricity is attempting to return to its “source.” If this was not the case, we all would find it very inconvenient if every time we wanted our flashlight to work we had to stick a wire in the ground. Head lamps would be even more interesting. 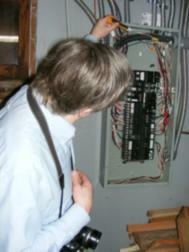 In the case of your home’s electrical system, “the source” means the transformer out at the street. Many people, including home inspectors assume that everything is returning to “ground” because we ground the electrical panel with all these big ground wires that run to rod rods, concrete encased electrodes and/or buried water pipes running to the home. It is understandably confusing—especially given that electricity always knows what it is doing and we do not. During normal operation of the electrical system, when you turn on your toaster, current flows through the toaster elements to adequately burn your toast the desired amount, and then returns to the transformer via the neutral conductor. The fact that there are ground rods connected to this neutral conductor in the service panel is of no consequence because the path over the neutral wire is so much better (easier) it simply does not take the path via the ground rods (or at least not enough to notice). When it does take that path, it means there is a HUGE problem with the electrical system. The earth does not make a very good way to conduct the current back to the transformer—and besides that, it drives the earthworms crazy. But that is in fact what happens. The electricity would run through the earth, up the utility company ground rod/wire at the pole and back to the transformer. So in this sense, the electricity is not completing its circuit to the ground--it is completing it back to the transformer—back to its source. When understood in this context, I hope it helps make it a little easier to understand why all metal components in the home have to be properly connected to the grounding system so that if the metal parts were to become energized, you would not be the only or easiest path between the energized pipe looking for a way back to the transformer. This becomes more of a matter of “how much” shock you will get as opposed to eliminating the chance of getting shocked altogether (and why GFCI’s are so important). In most homes this becomes fairly straightforward, but because so many people have no clue about how all this works, the grounding/bonding systems often become compromised. Take a look at the following picture. For some reason someone installed additional "plastic" shut-offs on the two water pipes. They are near the main water shut-off where the water pipe runs through the foundation to the street. This home was built at a time when the only means of grounding the electrical system was the water pipe to the street. There were no ground rods that would have provided some redundancy. The installation of the plastic components leaves the house grounding system to rely on the utility company ground rod at the transformer. If that grounding is severed (WAY more common than one might think), it places the entire electrical system at greater risk in the event that lighting should strike the transformer and there is no place for other types of high voltage surges to be directed to the earth. The purpose of the ground rods (water service pipe, concrete encased electrodes etc) is to deal with lightning strikes and high voltage surges that can be imposed on the system from either the utility or even created within the home (it does other things too but I want to keep in simple right now). These types of surges are why surge protectors are becoming more and more important in the home. The overall purpose of all those ground wires running all over the home and attached to all the metallic systems in the home is to create a very positive path back to the service panel so that the circuit breakers would trip off in the event of an electrical fault to those metal components. Sometimes clearing a fault that will trip the breaker would indeed still give you quite a shock--resulting in even death--but the house won’t burn down and cremate you. GFCI’s, Ground Fault Circuit Interrupters, can and will keep you alive however. Nobody wants to go to their own cremation prematurely. So to recap, our house grounding system has nothing to do with returning current to earth--it is always going back to the transformer--its source. Why are Weekend Warriors trying to kill themselves? Do you know what your downspouts are doing?